Gilbert Williams is a Louisiana-born Baptist and a Korean-War veteran. 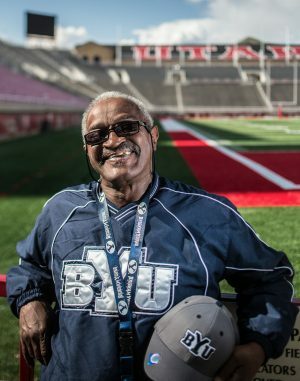 He started as a janitor but, after going back to school at age 60, now works as a certified nursing assistant at the veteran’s hospital right across the street from the U’s Rice-Eccles Stadium. And he just happens to be one of BYU’s most ardent advocates, having acquired a love for the school by watching Danny R. Ainge (BA ’92), Steve Young (BA ’84, JD ’94), and Ty H. Detmer (BS ’92) and reading up on the school’s values. In the heart of Ute country, Gilbert Williams, a Louisiana-born Baptist and a Korean-War veteran, reps the Y every day. He works across the street from the U's Rice Eccles Stadium, and he's always recruiting BYU supporters. Photo by Bradley Slade. “Gilbert really has no ties to BYU except he’s a great admirer of BYU athletics and is impressed by the university’s moral code and ethics,” says Lou Rudolf, a faculty member at the U of U whom Williams has been trying to recruit for years.